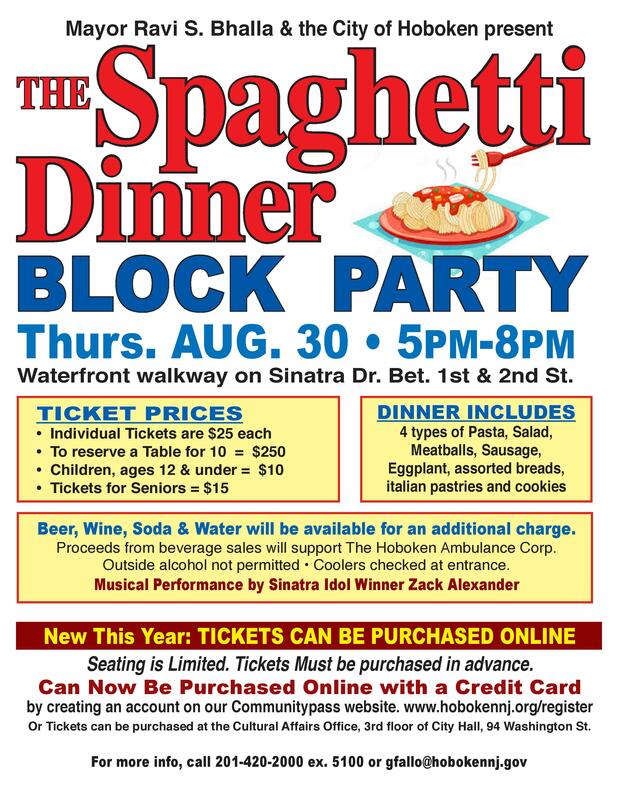 Mayor Ravi S. Bhalla and the City of Hoboken invite you to the 14th Annual Spaghetti Dinner Block Party on Thursday, August 30 from 5-8 p.m. along the waterfront walkway on Sinatra Drive between 1st and 2nd Streets. The evening will feature a musical performance by Sinatra Idol winner Zack Alexander and a dinner of four types of pasta, salad, meatballs, sausage, eggplant, assorted breads, Italian pastries, and cookies. Beer, wine, soda, and water will be available at an additional charge with proceeds of the beverage sales going to support the Hoboken Ambulance Corps. Seating is limited, and tickets must be purchased in advance at www.Hobokennj.org/register OR at the Cultural Affairs Office on the 3rd floor of City Hall, 94 Washington Street. The annual event was resurrected in 2005 for Hoboken’s 150th anniversary celebration. For more information, call (201) 420-2000 ext 5100 or email gfallo@hobokennj.gov.